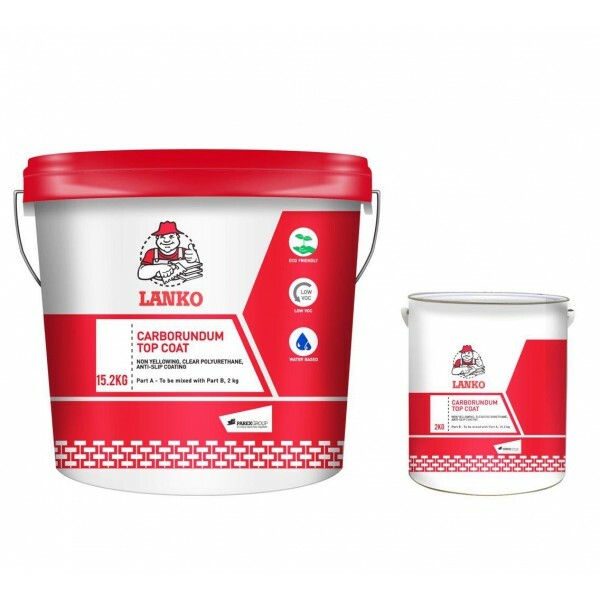 USES Lanko Carborundum Top Coat is specially formulated for both internal and external application and is ideal for refurbished flooring, pebble wash surfaces and any areas that requires slip and stain resistance. The use of Lanko Carborundum Top Coat on any exterior concrete surface provides a durable, long-lasting finish that has improves resistance to chemicals, oil, grease, and abrasion. Offers excellent slip resistance for slippery surfaces such as stone surfaces, pebble wash surfaces, and concrete Finishes. Seals all concrete surfaces making area easier to clean-up. Dustproofs concrete with a tough, durable film. May be used on all concrete surfaces, including stamped or stained concrete. Ease of maintenance by recoating to restore original beauty. Offers improved resistance to most acids and industrial chemicals, oil, grease.